Gildan Polos looks great and feels great. 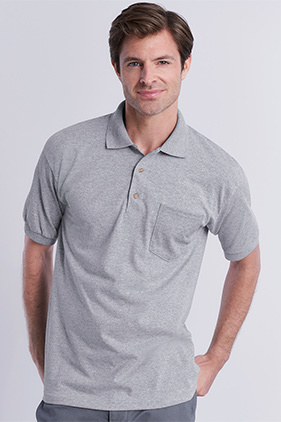 50% cotton/50% polyester 6 ounce jersey knit sport shirt with moisture wicking properties. Five point left chest pocket. Contoured welt collar and cuffs. Clean-finished placket with three woodtone buttons. Tubular construction. Heat transfer label.